Went to London today – the Royal Borough of Kensington and Chelsea. Bus, two trains and a half hour walk and we were at Holy Trinity Brompton. It was a beautiful service. It was an unusual mix of old church, stained glass windows and high ceilings but contemporary music, flashing lights, drums etc. The service would not have been out of place at Hillsong. At the end of the service people who could do so were invited to sing in tongues. This was a first for me but was beautiful and reverential (not that I sang) and not at all weird. Went for a walk around Knightsbridge. A bit of shoving as people desperate to get where they needed to be. 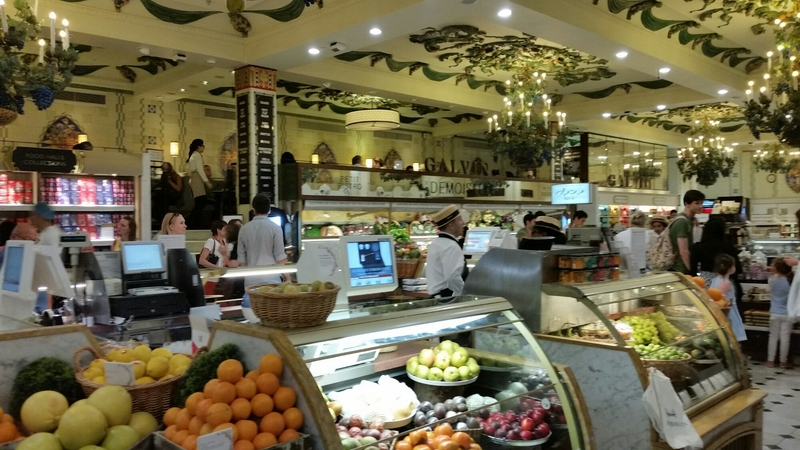 Dropped into Harrods and had a salmon bagel – ok, I admit I brought it with me! The wealth in Harrods! There was a 250g tin of caviar for over £2,000! Was full of people too – mostly foreign. 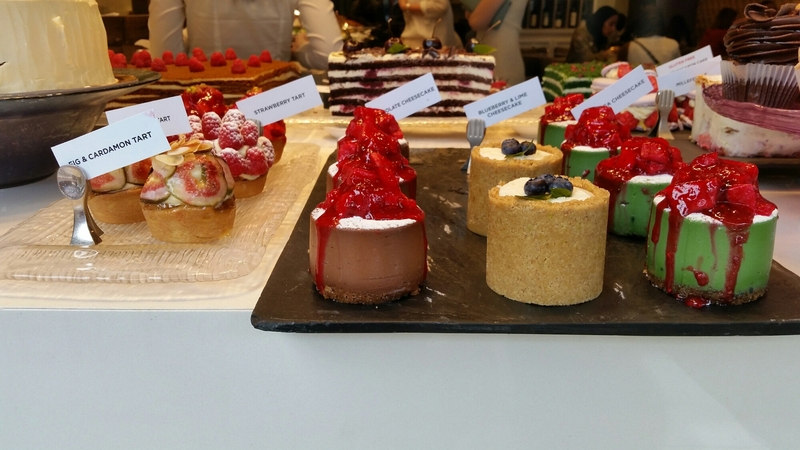 Window shopped for cakes – cheaper and less calories that way. They looked too good to eat anyway. Wandered down tothe Thames. So many expensive cars – ferraris, mercs, rollers in plenty. There’s still money here. There’s also rubbish, bags of it lying around. Some has escaped the bags and just lies around. 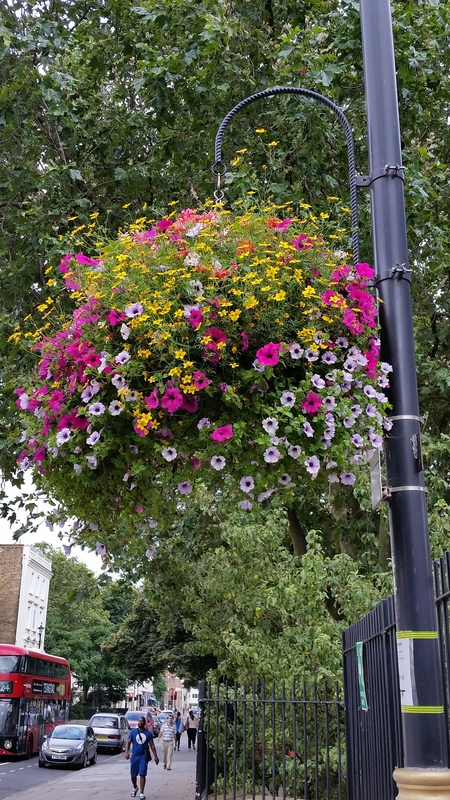 And then there’s the beauty of flowers and hanging baskets. Or stumbling across an ancient church. A real melting pot of people and things. Then we headed back to Bagshot, which was an adventure in itself. Walked to Pimlico to catch the Victoria line tube. As we’re on the tube there’s an announcement that there’s a partial closure of the District line – where we’re heading to. So we go back on the Victoria line south (hello Pimlico, good to see you again). We’re now at Clapham North but realise that would mean we catch the Overground train, not the underground. As we’d already spent £4.90 on one tube ticket, we were not keen to cough up more. Ok, back to the Victoria line and head north again. Hello Pimlico, did you miss us? From Victoria to Earls Court and now change to the train replacement bus service (did you remember about the partial closure of the District line?). 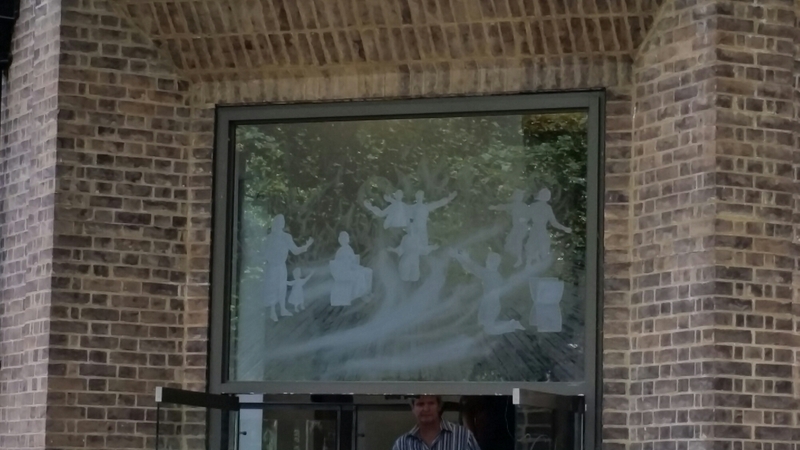 First stop is West Brompton – our stop. Bus drives for a long way before it stops and we find its gone past West Brompton! It didn’t stop there. 20 minute walk back to get there. Our step count for the day is already up to 15,000 so we’re not keen. Train replacement bus service back the other way to Earl’s Court. We ask as we get on the bus if they stop at West Brompton. Yes of course they do and find it amusing that we ask.At the first stop we start to get off and ask if its West Brompton and they (the driver has an assistant to direct her) tell us they’ve gone past it – now we know why they were laughing! We get off not amused. Turn on the GPS and find its only a 5 minute walk. Its taken us around 1 1/2 hours and we’re at the first station of our 3 segments still to go journey. The rest of the journey was relatively uneventful by comparison and we get back having travelled for 3 hours and a new world record step count of 18,600.